On June 15th 8 Limbs Yoga Centers hosted “Cultural Competency: A Conversation.” This was the second in a series of conversations that began in April. The following is my account of the teachings of the session. The conversation started by framing its purpose being to find a middle ground where growth happens: outside of being comfortable while not being overwhelming. The facilitators created a list of “Brave Space Agreements” that created boundaries that foster a culturally competent conversation. Two of those agreements were “Speak from your own experience” and “Don’t assume you know others’ experience.” It was made clear that this was a conversation centered on racism, but to isolate racism specifically is an artificial distinction of oppression. We can’t fully understand oppression through racism without understanding the intersectionality of all oppression. We used the definition of intersectionality as: interlocking oppressions that create a unique and specific experience of marginalization. A third notable Agreement was “Respect Intention.” Specifically, while respecting each other’s intentions, we also need to accept that having good intentions does not free us from the consequences of the impact of our actions. If something I say is hurtful, the hurt is just as valid even if the words came from good intentions. Three smaller groups worked on each perspective, with Internalized and Interpersonal grouped together. How does racism and white privilege show up in our own experiences of yoga on each of the levels of oppression? What solutions exist to address and alleviate the oppression? “Racism” and “White Privilege” can be harsh words to describe the actions we identify with ourselves, our institutions, and our society. According to our definitions, that is reality. To be more intimately in touch with that reality will mean challenging ourselves to engage in difficult conversations and challenging society’s deeply embedded norms. For example: society’s norms of how studios advertise or address equal access to classes and training. It was a strong feeling in the room that facing these conversations can illicit shame, blame, and guilt. Fortunately, this puts us in another advantaged place as yoga practitioners: we know that growth comes from acknowledging and sitting with the discomfort of those feelings, rather than disassociating or acting out of reaction. We can use the embodiment of that discomfort towards action. 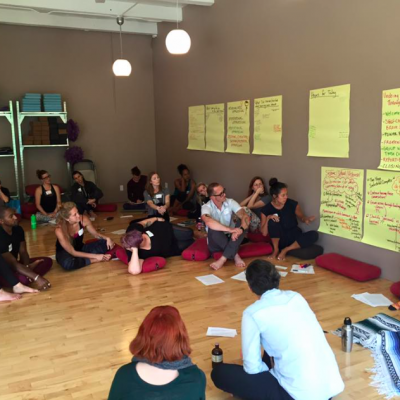 In the advice of Rosa Vissers, the Executive Director of Yoga Behind Bars, we can use that discomfort to “take responsibility as white folks, rather than depending on people of color to sort out [the implications of] oppression for us.” This acceptance of responsibility could be the first major hurdle to overcome on the path to creating more solutions to oppression. An underlying takeaway from the afternoon was that the full room of approximately 40 people shows that there is an active community eager for change. History and experience has taught us that the change needed will happen faster with a village mentality, together. In a place especially like Seattle, where a social “freeze” can make it challenging to find like-minded people, the evolution it took to get this room of people introduced and talking to each other about cultural competency is a major accomplishment. When available, join the Facebook group, tentatively named PNW Yogis for Social Justice/Equity. Attend a panel on Cultural Appropriation in yoga, coming this fall. More details to be announced. 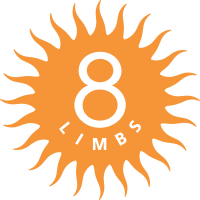 Mark your calendar to participate in the next training: Beyond Inclusion, Beyond Empowerment, on December 9 at 8 Limbs Phinney Ridge.